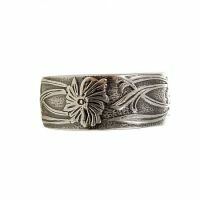 Entwined vines and a floral pattern that flow gracefully around a 8.0mm wide band. Manufactured from milled patterned stock that was imprinted by antique roller wheel dies. 6.0mm wide band with sapphires and round brilliant cut diamond accents in a floral and lattice like pattern. 7.0mm wide band with marquise cut sapphires and round brilliant cut diamond accents in 14k white or yellow gold.